In 1940, the average cost of a new house was $3920, the average family income was $1725, a gallon of gas cost 11 cents, and the average cost of a new car was $850. 1940 was also the year the stunner shown below rolled off the production line. It didn’t look quite like it does now, though, because this ’40 Ford has been the subject of a frame-off rebuild, turning it into the street rod you see today. Imagine the luxury and fun of sliding behind the wheel of this amazing, head-turning car, and cruising in style to a car show or pretty much anywhere you get inspired to go. 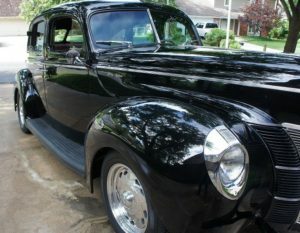 This four door 1940 Ford Deluxe has undergone a complete frame-off rebuild. It’s an all-metal car, with no rust on it anywhere. What Is a Frame-Off Rebuild? Before I move on, I know most everyone reading this already knows what a frame-off rebuild is, but just to be sure, in a frame-off rebuild, like with a frame-off restoration, the car is completely taken apart, with the body and all components removed from the frame, so each and every detail can be inspected and perfected before the car is reassembled. The 8BA Ford Flathead is a V8 engine, which came out in 1949. The 8BA isn’t original to the 1940 Ford Deluxe Sedan, but that’s okay, because it’s a street rod, and that means it’s customized to have more power and comfort features than it rolled off the line with in 1940. The radio is one this that is standard in this ’40 Ford. It has original radio in it, and it still works ! According to the seller, this car runs cool when you’re in traffic, and the radiator’s electric cooling fan is set up on a temperature control switch, plus it has a manual switch to turn it on if you feel it needs to be on sooner. The seller also notes this 1940 Ford Deluxe is quiet, with no rattles, and the tires shown in the photo are not included with the sale, but a set of classic red steelies do come with this stunner of a ride. A special thanks goes out to eBay and Izea, my corporate sponsors in bringing you this post.